Certain environments demand a product that is a notch above the rest. In certain commercial environments, flooring is rigorously put the test day-in and day-out. If you find yourself pushing your flooring to the limit, you may need to consider a commercial floor coating the next time you upgrade your flooring. 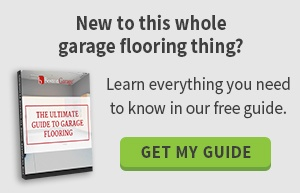 The obvious choice, a garage is the perfect environment for new commercial flooring. In a commercial garage environment, the most important factors for new flooring are: safety, durability, and comfort. Epoxy floor coatings can provide consumers with a slip-resistant environment enabling business owners to avoid dangerous work environments for employees. A Polyurea Polyaspartic coating system also allows garage floors to stay scratch, scuff, and crack-free due to the impressive durability of the flooring. Lastly, commercial floor coatings provide users a comfortable floor to work on. You’ll find walking and even lying on commercial floor coating much preferable to concrete when working on your next project. If you have normal flooring in your locker room, you may find consumers slipping, sliding, and failing often. 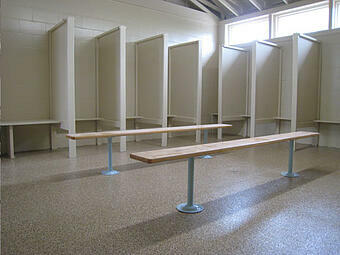 By using epoxy floor coatings in your locker room, you eliminate the chance your customers may slip and fall. Not only does the slip-resistant ability of commercial flooring offer great benefit to a locker room environment, the durability has the ability to withstand the high foot traffic many locker rooms attract. A bathroom is a breeding ground for bacteria and viruses. Bathrooms in commercial environments can be much worse. People may aspire to keep their bathroom at home in pristine shape, then show complete disregard for a workplace bathroom. With these facts in mind, keeping your company’s bathroom clean and healthy for your patrons is an important aspect of business. A commercial floor coating will enable you to keep your bathroom in tip-top shape during the day-to-day work environment. Epoxy floor coatings are not porous, thus will not allow your flooring to be penetrated by bacteria and viruses. It can also increase the attractiveness of your bathroom by giving the space a fresh and clean vibe. Floor coatings increase bathroom attractiveness by improving the aesthetic qualities of the environment. If there is one environment that demands a safe, durable, and long lasting flooring it is the warehouse environment. Commercial floor coatings are a perfect fit for a warehouse environment due to the beating the floor of a warehouse takes. Heavy foot traffic, moving machinery, and moving product demand a floor that is first and foremost safe. Flooring in a warehouse environment also needs to be durable, as any floor in a warehouse will take a beating. The warehouse environment absolutely demands commercial floor coating to promote a safe workplace. Warehouse environments can be dull, depressing, and grey. By adding a commercial floor coating, you can easily add an aesthetically pleasing element to your dull warehouse workspace. Waiting rooms are typically high foot traffic areas. Most patrons of your business spend some amount of time in your waiting room. You want your waiting room floor to be aesthetically pleasing and durable. By installing a commercial floor coating, you can ensure you have an attractive floor no matter how much foot traffic you have. Your floor will look good while maintaining its long lasting and clean appeal. No cracking, scratching, or scuffing makes upgrading your floor system a good investment for the long haul in your business. Still, not sure if commercial floor coating is right for your next project? If you are considering using commercial floor coating for your next project, click here for more information on the benefits of using commercial floor coatings.